I hope you can all join me next Thursday for my version of the Colbert Report, when I’ll have a chance to tell VCIA Members what VCIA is doing legislatively in Vermont, DC and internationally to keep the captive industry strong and thriving. I’ll be joined by Deputy Commissioner Dave Provost and VCIA’S DC counsel, Jim McIntyre, to inform our members on what’s happening at the state, federal and international level with legislation and regulations potentially impacting captives. Thanks to all who joined us in beautiful Burlington, Vermont, a couple of weeks ago for VCIA’s annual conference. Without a doubt, it was a terrific 2 ½ days with great programs, networking and events. With over 1000 attendees from 41 states and 14 countries, our annual gathering in August has grown to be THE captive insurance forum! To quote from one of our attendees “All the important captive market players from North America and parts of Europe were in attendance.” And many thanks to our sponsors and exhibitors without whom we could not put on such an event, as well as to the hundreds of volunteers who make it happen. Now after a little break, we are back in the saddle again looking out for the captive industry. Currently we are working with U.S. Treasury on changes to the TRIA data call for captives, fighting to pass the NRRA clarification bill, and generally looking out for the captive insurance industry. You got to be a tough hombre to keep the posse moving! Janice Valgoi and I are in DC this week for the 2016 PIAA Medical Liability Conference, where we are working the floor spreading the good word about captive insurance. The conference brings together hundreds of professionals who work in insurance and alternative risk transfer, all looking to gain new insights on the global and day-to-day issues facing medical liability. Today, no industry is changing as quickly or fundamentally as healthcare. At the same time, escalating medical professional liability costs have become a critical issue for health care providers and those seeking to improve health care value and outcomes. Healthcare continues to be one of Vermont’s most abundant sectors. Currently 96 hospital and doctors’ groups have Vermont Captives, making it the second largest sector for captives trailing manufacturing with 100. Successful MPL captives can measure the success of hospitals and physician groups in improving the safety of care by the degree to which malpractice asserts for those organizations declined over time. After all, everything else being equal, if safety has improved, the chance of doing harm and being sued should drop. Further, to the extent a captive is successful at helping its members carry out risk management programs, actuarial assumptions can be modified, and premiums should go down. Also, since previous premiums were based on old actuarial assumptions, an effective captive should generate a surplus in earnings that can be returned to its members. Save money = save lives! If you are at the PIAA conference, swing on by to say hello! Just got back from the insurance marathon, better known as the RIMS conference. This above is the advice Dan Towle, Director of Financial Services for the State of Vermont, gives all of us who attend and work at the Vermont both. Indeed he is correct – I needed to put my feet up for two days after! And it can be dangerous: we had to dodge the opening night fireworks when a malfunction sent the projectiles into the audience! Four days in San Diego doesn’t sound like a hardship, does it? And especially when you have so many great people working with you over the course of the event. Besides Dan, there were a number of folks from the Department of Financial Regulation, including Dave Provost, Sandy Bigglestone, Dan Petterson, Jonathan Spencer (what is that story about a rabbit attacking you again?) and Stacy Alden. Some of our members staffing the cause were Steve Killoran from Maple Capital, Chris Turley from TD Bank, Bob Gagliardi from AIG Insurance Management Services, and Pete Kranz from Beecher Carlson. Include me, Janice Valgoi from VCIA and the intrepid Maddie Moninghoff from Skillet Design & Marketing and every angle was covered. RIMS is fun, but also a great way to meet our members who attend and talk to the many folks who are considering a captive. Even though over 10,000 people attend RIMS, Vermont stands out as the place to go to cover captives. Great work everyone! Thank you all very much, and I always look forward to hearing from you! I just returned from the National Risk Retention Association (NRRA) national conference in Chicago this week. Just like “Frisco” is frowned upon by the denizens of San Francisco, natives of the Windy City look askance at folks who call their great city “Chi-Town”. Lessoned learned. Joe Deems and his crew had a good turnout for the conference. Vermont always has a good attendance for this conference, which is no surprise seeing that over a third of all active RRGs are domiciled in the Green Mountain State. Besides Dave Provost, Sandy Bigglestone and Dan Towle representing the State of Vermont, other Vermonters taking part included Nancy Gray from Aon, Kate Boucher from American Excess Insurance Exchange, Mitch Cantor from ICCIE, Len Crouse and Dustin Partlow from JLT Towner, Christina Kindstedt from Willis, and John Prescott and Brad Klein from Johnson Lambert. A panel of RRG owners and VCIA members Tim Padovese of OMIC and Siri Gadbois of EIIA, along with Nancy Gray, spoke to the importance of proactive leadership both within their organizations and outside to strengthen the RRG and captive community. And Lynn Crisci of HAI Group participated on a panel covering cyber security. Skip Myers of Morris Manning & Martin (and another VCIA member!) provided a refreshing outlook on where the National Association of Insurance Commissioners (NAIC) focus is regarding RRGs. After many years of scrutiny that included the adoptions by states of model laws and regulations, and governance standards, it looks like the NAIC has run its course and has diverted its attention to other sectors of the broader captive insurance market (will it never end!). Senator Ben Nelson, the CEO of the NAIC was the keynote speaker at the conference. While I applaud Senator Nelson’s willingness to address the industry, it was clear there is still misunderstanding at the NAIC regarding the role and importance of the RRG industry. His basic take on RRGs is that they have a very limited scope that should not be broadened. Although he hinted that the market circumstances in the future may provide the impetus to expand the role of RRGs in the insurance market. Hopefully the willingness to enter into a more open dialog can begin to break down misconceptions and bring better change to the RRG industry. I will be back in Chi-Town (er, Chicago) this month for one of VCIA’s world-famous Road Shows on October 13th. Go to www.vcia.com for more information – hope you can join us. Thanks and keep in touch! A friend of mine gave me tickets to the Red Sox – Yankees game down in Fenway Park last week. Now normally those tickets would be next to impossible to get, but since the Sox were scraping the bottom of the standings there wasn’t quite the same hype for The Game as in years past. That being said, anytime you can get to Major League baseball’s holiest shrine is always fun – and the weather was great, hotdogs tasty and beer cold. What a night! But as I was sipping my $8.00 can of beer, I couldn’t help reflect that MLB has a captive in Vermont (which delighted my 15 year-old to no end – yawn) and then slipped into what Dave Provost, Vermont’s Deputy Commissioner in charge of captives, does when he is travelling around the country: identifying all the companies and organizations you bump into that have captives in Vermont. Brushed my teeth with Crest in the morning, zipped up my jeans with a YKK zipper, checked the weather on CBS, closed my Marvin windows, got into my Toyota, buckled my seat belt made by Takata (maybe should double check those…), filled up at a Mobil station, and sipped my Starbucks on the way there… and I hadn’t even arrived in Boston yet! Next year, we’re going to Disney World! Hope you can join us for our upcoming VCIA webinar: The Sweet Spot! Finding the Right Retention Level for Your Captive, on September 16. Our expert speakers, including Google’s director of business risk and insurance, will share their thoughts and experiences on what to consider when determining how much risk to retain within your captive. By the way, for all you Yankee fans out there, even though Sox pitcher Porcello pitched a good game Boston lost 3 – 1. Thanks and keep in touch! One of the concerns that percolates every so often in the captive insurance industry is the need to attract young, bright people to this particular version of risk management. What one of captive insurance’s more thoughtful leaders, Michael Bemi of The National Catholic RRG, calls the graying of the industry. Of course, many trades face this conundrum including the traditional insurance industry; but it is a valid concern for our industry as well. Well, having just returned from a trip to Philadelphia where I met a bunch of young, bright students of risk management from Temple University, I can say there is hope for us all! As many of you know, VCIA hosts a number of half-day seminars around the country extolling the virtues of the captive insurance industry (and maybe the virtues of Vermont as a domicile) – we call it our captive Road Show – and we held one in Philadelphia earlier this week. 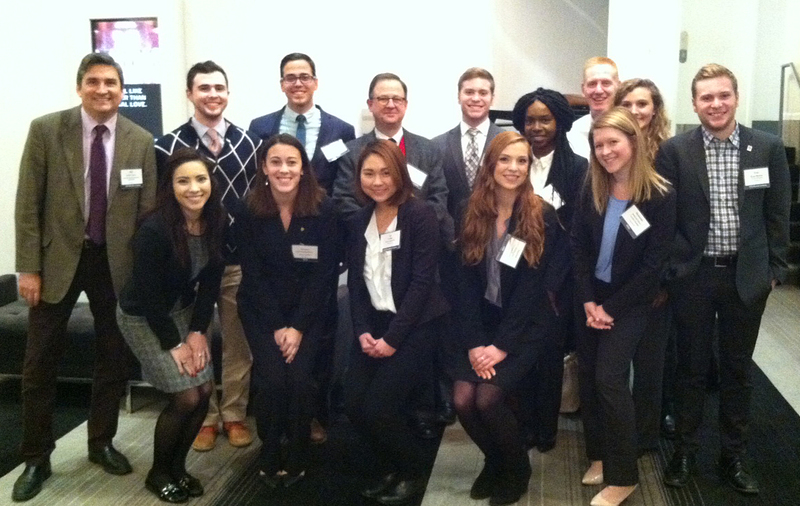 There, Mike Zuckerman, a professor at Temple’s Fox School of Business in Risk, Insurance and Healthcare Management, and an involved VCIA member and advocate, brought a dozen or so of his students to hear firsthand about captives. And they heard from the best: Anne Marie Towle, Vice President and Senior Consultant, Willis Global Captive Practice; Eric Dethlefs, President & CEO, Cassatt Insurance Group; and Glen Welch, President, Cooperative Partnership Insurance Company. And, of course, the dynamic duo from Vermont: Deputy Commissioner Dave Provost and Director of Financial Service Dan Towle. It is always a heartening experience as we “older” folks grumble about the youth of today, to meet young folks like this. The students were attentive and poised. They showed real interest in the captive industry and asked great questions. I will continue to be concerned about where the next generation of captive professionals will come from, but meeting these fine folks lets me sleep better at night!